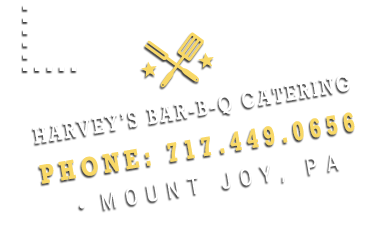 Harvey's Barbecue is Central Pennsylvania's favorite BBQ. Whether you spell it BBQ, Barbeque or Barbecue, Harvey's Main Street BBQ knows how to prepare it just right! Stop in for mouth-watering ribs, our award-winning Bar-B-Q chicken, slow-roasted pork, tender beef brisket, homemade sides and so much more! Planning a company picnic, special event or wedding? Make your event extra-special with the mouth-watering flavor of fresh barbecue, homemade sides, desserts and more. We handle it all from cooking to cleanup! See our catering menu or contact us for all the details! ©2019, Harvey’s Main Street Bar-B-Q. All Rights Reserved.